Travel options available at Darwin are quite reasonable and come in the form of buses, taxis and bicycles, while there is also a nearby international airport lying to the north-east of the city. Connected via the Stuart Highway, Darwin is located approximately 13 km / 8 miles from its airport and its reliable transport infrastructure ensures that this facility is always easy to reach. 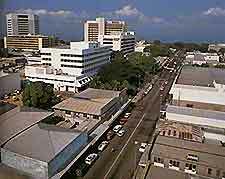 The city of Darwin has plenty of car parks and off-street parking available around the city centre and driving here is not difficult. Nearby, major roads connect the town to many other areas of the Northern Territory, such as the national parks of Litchfield, Mary River and Kakadu. 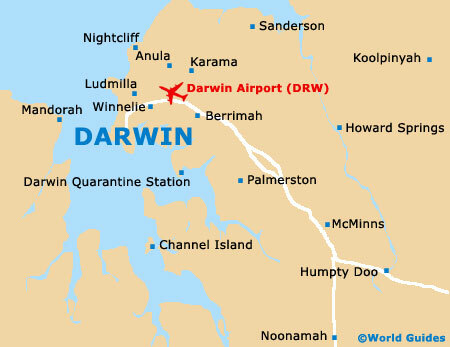 Served by Darwin International Airport, one of the most important air facilities in the Northern Territory, the airport is situated just 13 km / 8 miles away and resides within the suburb of Marrara. The airport is especially historic and has its origins way back in 1919, and today features a number of international and domestic flights, with airlines including Airnorth, Jetstar Airway, Qantas, Skywest Airlines, Virgin Australia and Vincent Aviation. Onsite transport options include buses, shuttle buses and taxis, all of which are readily available outside of the main terminal building. Renting a car is generally the most popular way to travel around the Northern Territory, with many firms offering discounts for car rentals of three days or more. Major car rental companies available at Darwin Airport include the likes of Avis, Hertz, Budget and Territory Thrifty Car Rental. Owned and managed by the Northern Territory Government, the bus network in Darwin is operated by Darwinbus and connects various local places of interest, including Alawa, Berrimah, the Charles Darwin University, Fannie Bay, the Hospital Precinct, Marrara, Moil, Nightcliff, Rapid Creek and Winnellie. Regular daily bus services travel outside of the city and link many nearby areas, such as the suburbs of Casuarina, Coolalinga, Howard Springs, Karama, Leanyer, Malak, the McMinns Lagoon and Palmerston, as well as the neighbouring town of Humpty Doo, roughly 40 minutes to the south-east. Local taxis are operated by City Radio Taxis and Darwin Radio Taxis, both of which provide one of the most convenient ways to travel around the area. These taxi cabs are usually fairly cheap and run all over the city, being ideal for short journeys. Darwin is home to an extensive network of cycle trails and pathways, which travel around many of the neighbouring recreational areas and scenic suburbs. Carrying drinking water at all times is a good idea when cycling in Australia, particularly during hot weather. Of note, scooters and bicycles can be hired either by the hour or by the day.